The Value of Click Through Rate Data. The click through rate of a query is the percentage of the time that searchers saw your site’s listing in search results and clicked on it. As we found in the study we did last year, there’s no such thing as an “average” click through rate for each ranking position. The only actionable data from web-wide or industry-specific click through rate averages is that generally speaking (although not always), higher ranked listings get more clicks than lower ranked listings. The listing for www.footaction.com in the result for”basketball shoes” below is ranked #5, but it may not have the same click through as the cool-looking YouTube video ranked at #5 for the much less cluttered results for “bald eagles and crows”. While web-wide and even industry-wide averages aren’t that useful, we found lots of actionable data in site-specific click through rates (particularly when segmented by topic). Keylime Toolbox aggregates all available Google organic query data and provides customized click through rate data for your site, segmented however you’d like. Here’s how to make the best use of it. 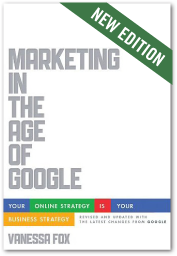 When doing keyword research for gap analysis or content strategy, understanding market opportunity is critical. Sure, a keyword may get 50,000 searches a month, but no single site is going to get all 50,000 clicks. What’s a reasonable number of clicks to forecast? If you’re focusing on a particular keyword and have a specific ranking goal for it, you can use average click through rates your site sees for similar keywords to estimate traffic. For instance, let’s say the keyword above with 50,000 searches a month is “healthy smoothies” and your site already gets a lot of traffic for other health-related queries (like “healthy dinner recipes” and “healthy snacks”). You can create a healthy-related query segment that aggregates all of these queries together and provides data on how the queries do overall. If your ranking target was #5, you could estimate Google organic traffic of around 6,000 if you met that goal (50,000 * 12%). 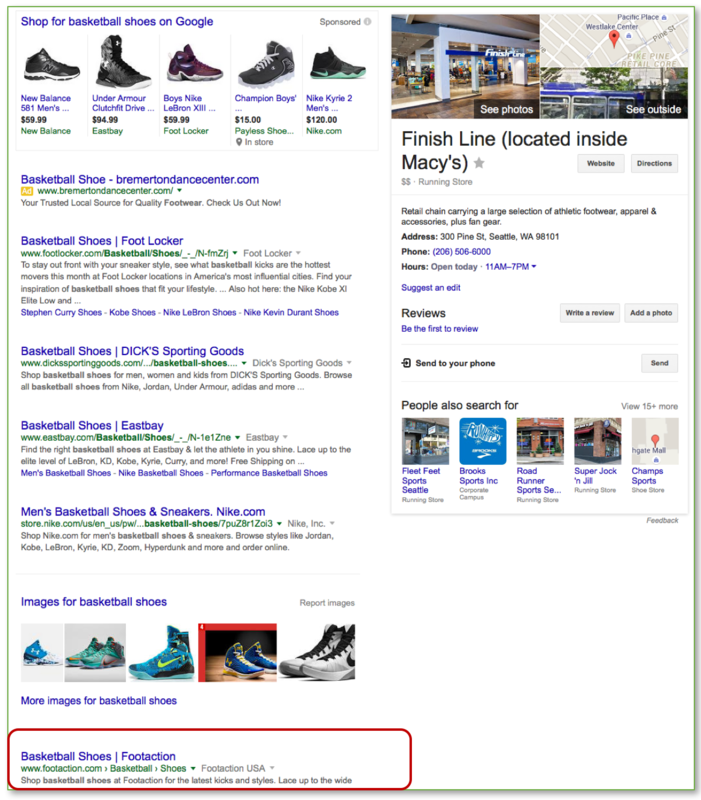 More likely, you’ll have a set of keywords you’ve identified during the keyword research process. This might be from a gap analysis project (see our post on using Keylime Toolbox for gap analysis research) or keywords for a new content area. In this case, you can use a model that estimates a ranking distribution for the new keywords that’s similar to how the site ranks for existing keywords to forecast market opportunity. You estimate that the new content should be able to rank for those keywords in a similar way to how the site ranks for other healthy-related keywords. 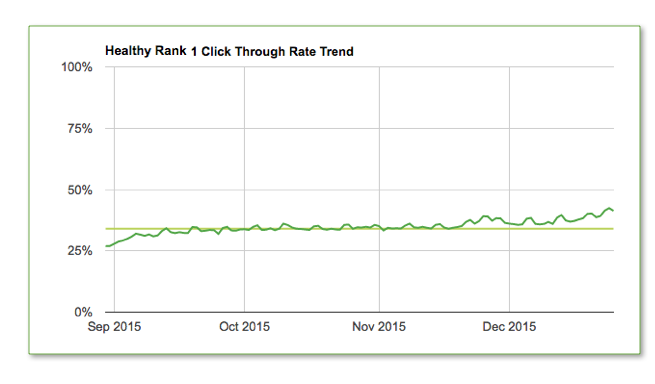 You’ve seen the overall click through rate averages above. You can see the detailed model from Tools >Market Opportunity Forecast. Click on the query segment you’d like to see details for. 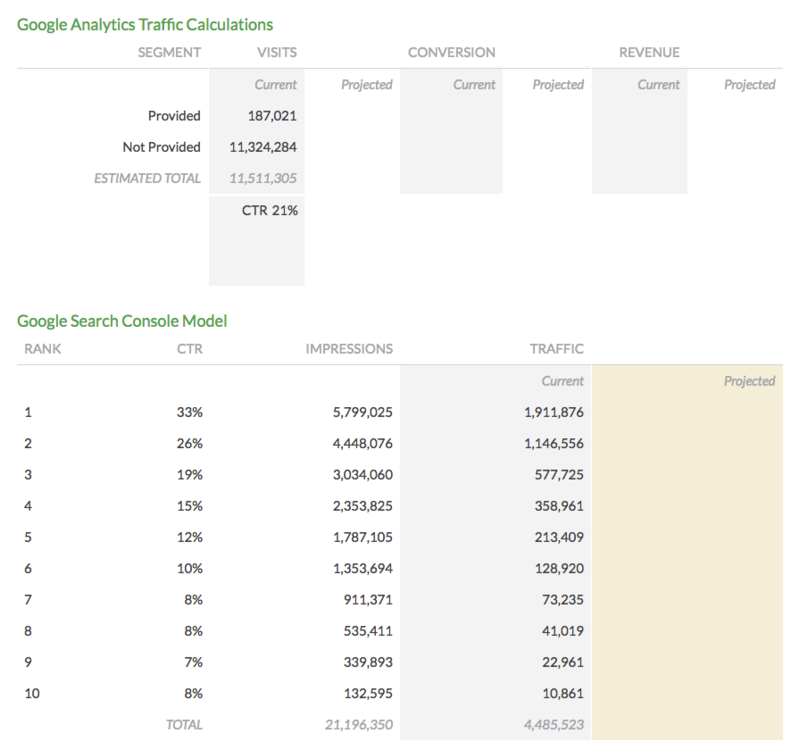 You’ll see the total impressions and traffic at each ranking position, as well as an estimated total traffic from queries in that segment (based on how Keylime Toolbox distributes “not provided” data; you can read more about how the estimated total traffic is calculated here). Assuming a similar distribution, you can just use the average CTR for the segment, which you can see in the image above is at 21%. That information is also available from the Query Details tab. Just select the segment from the Segment drop-down menu. Using this method, you can forecast a 21% average CTR for the 175,000 searches done for your 10 new keywords for a total market opportunity of 36,750. Let’s say you’ve decided to target a whole new topic area and you don’t have a similar set of keywords to use as a model. In this case, it’s best to go with the more general data available from the “Unbranded” segment. That data is tailored to your site and excludes branded queries (which tend to have higher click through rates overall). This forecast may not be as accurate as using data from a similar topic area, but it’s the best data available for calculating opportunity for new content areas. 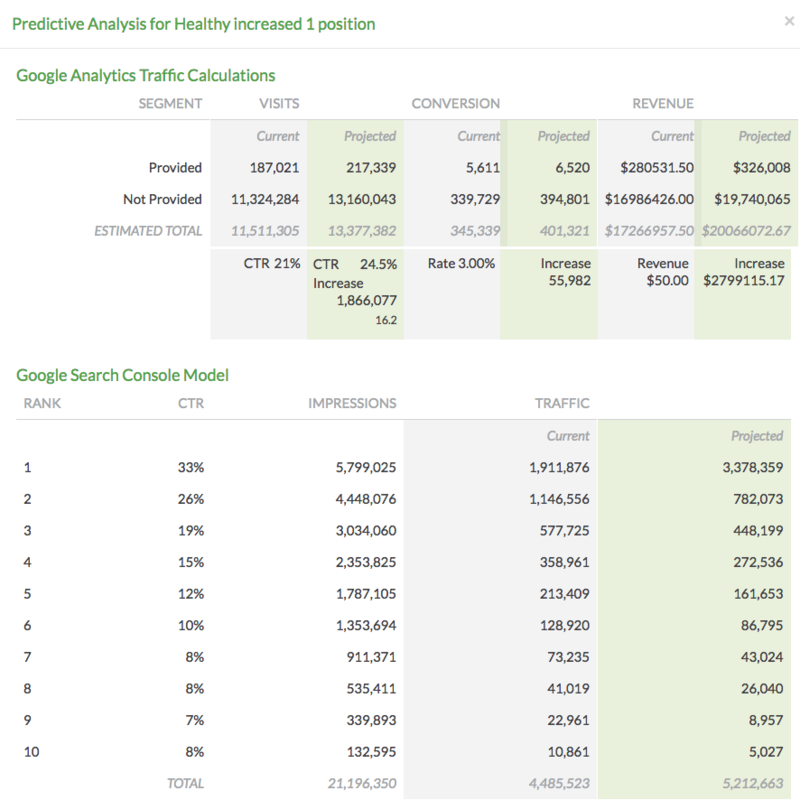 You can use click through rate data to estimate the ROI of investments to improve ranking as well. 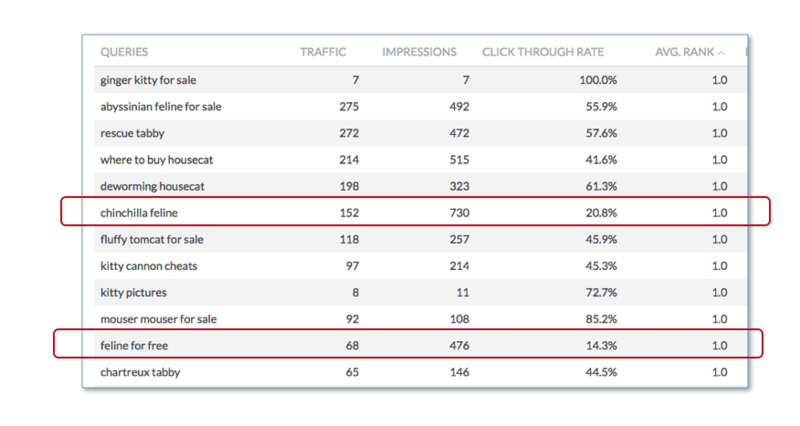 Remember that model that shows impressions and click through rates at each ranking position? Keylime Toolbox provides a handy calculator that forecasts what traffic increases you might see from improved rankings (based on projected improved click through rates). Just navigate to Tools > Market Opportunity Forecast and then select the average increase you’re targeting. You can also choose a specific date range to use as a model (as certain topics have different search volume depending on the time of year). If you’d like, you can also include conversion rate and revenue data for each segment to forecast changes in conversion and revenue. This calculator uses modeling data from your site. You can check out the details of any segment by clicking on it. For example, if you searched for “women’s clothing sale”, which result would you be more likely to click on (assuming the Madewell listing ranked for that query at all)? 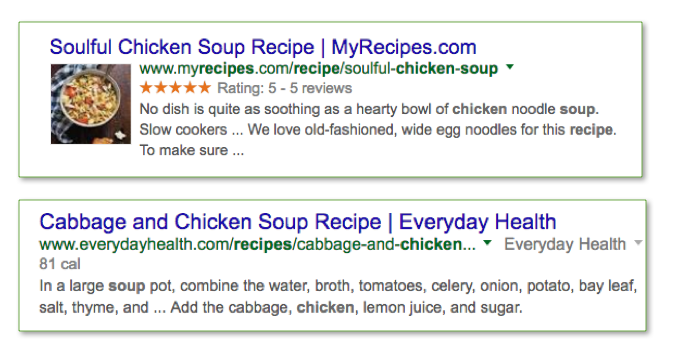 How about for this search for “chicken soup recipe”? It’s worthwhile to take a look at even branded queries. 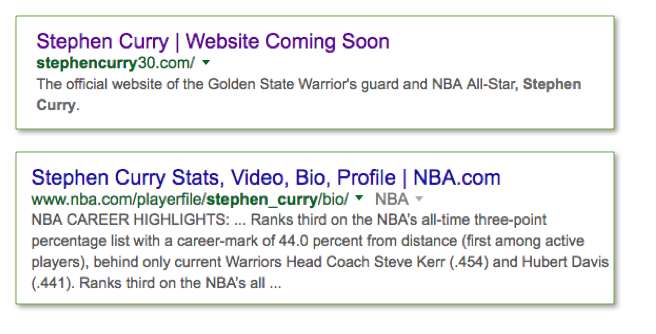 Which of these would you click on when searching for “Steph Curry”? Sure, his official site ranks #1, but it may not get the most clicks. You can identify where to make improvements and then monitor the impact you make to the search results display in several ways using Keylime Toolbox. From the Query Details tab, you can view a report of all queries that brought traffic to the site from Google organic search and export that report to Excel. From there, you can do all types of analysis to identify key areas of opportunity. For instance, you can filter all queries ranked at #1 with a CTR below 20% and then investigate display issues with those queries. You can also sort the columns directly in Keylime Toolbox. For instance, you can see a set of queries below ranked at #1. Two queries have considerably lower CTR than the others. You can look at lift in click through rate averages across all queries or for queries in a particular segment using the SEO Trends reports. 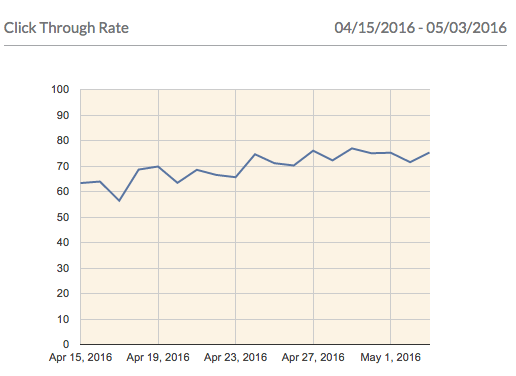 These reports graph SEO metrics over time and can compare date ranges. 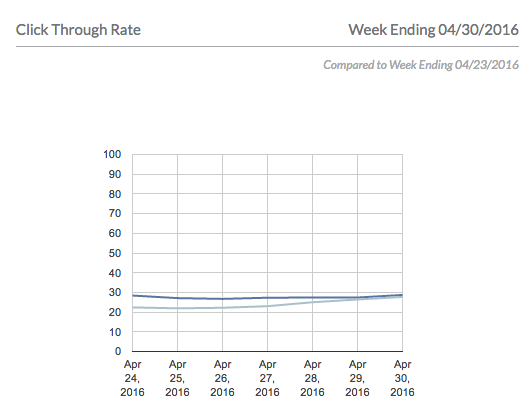 The Click Through Rate chart is great for measuring progress in cases where rankings are steady (if rankings are also changing, that may be impacting click through rates as well). Below you can see lift in a particular segment of queries during the course of two weeks (a typical amount of time it might take Google to recrawl the site and update titles, descriptions, and rich market in search results). Below is an example of comparing date ranges (in this case, the week before the display change compared to the week after). If rankings are changing as well or you’re expanding the number of queries that site appears for (both metrics you can monitor from the Keylime Toolbox SEO Metrics reports), then you can look more specifically at click through rate changes at each ranking position to get a sense of impact. From the Click Through Rate tab, choose the date range you want to review and click any box (query segment + ranking position). You’ll see the average CTR for that segment (or all queries) at that ranking position charted over time against the overall average. 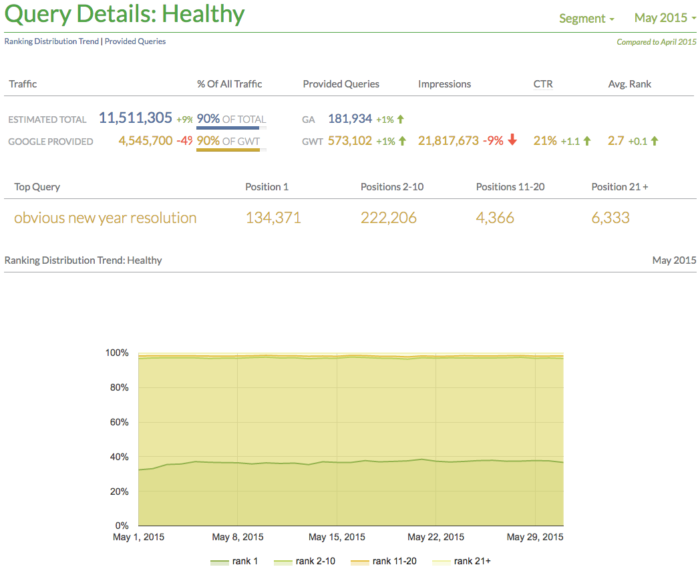 Charting CTR over time for each ranking position individually eliminates the impact of overall CTR changes due to factors like ranking changes or increased or decreased query coverage. So far, we’ve talked about click through rates going up, but Keylime Toolbox can help you identify when click through rates have gone down as well. If Google organic traffic has dropped, you can first check the SEO Metrics Overview tab and compare two date ranges (year over year data is best if you have data that far back) to see if the drop is due to a loss of ranking, impressions (generally due to either search volume or loss of query visibility), or click through rate. The SEO Metrics Overview report will also help you identify if traffic has dropped generally or for specific topic areas. You can use the SEO Trends report to see if traffic changes correlate with CTR changes (vs. changes to other metrics). Keylime Toolbox gets CTR (and other SEO) data directly from Google’s API and stores it over time so you can view historical trends and compare date ranges. 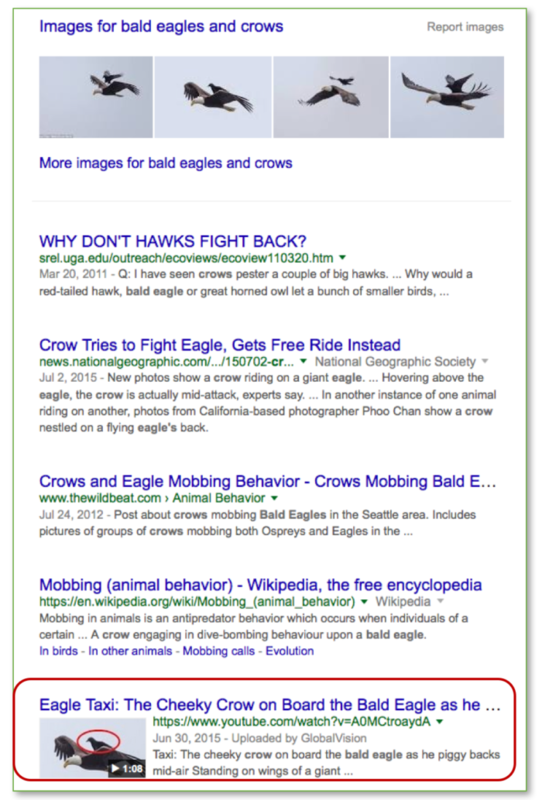 Each searcher sees a slightly different set of search results and has different click behavior. The data you see in Keylime Toolbox is averaged data from all searchers who saw your listing in Google search results. By using the API to get data directly and storing data by day, as well as aggregating and deduplicating subfolder data, Keylime Toolbox can provide significantly more queries than the 1,000 you see in Google Search Console. In fact, for some sites, Keylime Toolbox is providing more than 1 million queries a month. If you’re not already using Keylime Toolbox, you can check out a free trial and see what your site’s click through rates really are.